Hello Future bankers, there is a great news to all of you who applied for SBI Clerk examination 2018. 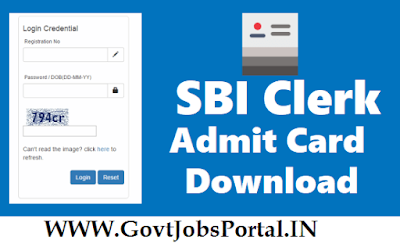 Today SBI official issued a notification in which they said that the candidates who has applied for this examination can now download their admit card for the SBI Pre-Examination. Below under IMPORTANT LINK section, we share the direct link to download your admit card. Just click on the link and you will redirect to the page from where you can easily download your admit card for Pre-Examination. Best of luck to the participants who are going to appear in this SBI Clerk Examination. 1. You need your Registration No (or) Roll No. 2. You need your Password which you create during registration process (OR) Your Date of Birth. These credentials required to download your Admit cards for this SBI Clerk examination. 30th June 2018 is the Last Date to download Admit cards.